The SoundsCreative concept was concocted by the vision and enthusiasm of Tara Franks, who believes everything in life stems from who we meet, the unexpected conversations we develop, the random opportunities we jump on and the experiences we encounter by walking a different route whenever possible. Tara believes that our individual and group engagement in music can be as strong whatever age we are. Whether 2 or 62 we all have something inherent that music taps into. We all have a capacity and need to play. Tara is the driving force and Artistic Director of SoundsCreative Projects; conjuring up new ideas, designing the commissions and leading many of the Neighbourhood Projects including Tots Tunes and Vox Voices and gathering together and collaborating with a growing collective of Connected Artists. 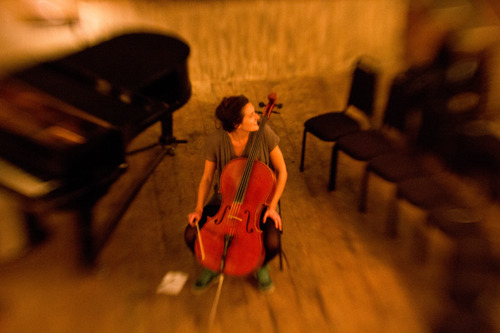 Tara is a performing cellist, composer and creative project leader. She plays and writes with her contemporary trio Quest Ensemble and experimental string duo Balladeste, she collaborates on cross-arts projects including creating the sound for theatre, dance and visual arts installations. She has led creative projects for organisations including Barbican, Royal Opera House, Aldeburgh Music and Kobe University, Japan. Tara studied cello performance at Leeds University, and later undertook an MMus in Leadership at Guildhall School of Music and Drama. Having also trained and worked as a KS2 teacher. Tara combines her skills, experience and beliefs in SoundsCreative Projects, to develop quality musical experiences.